I seem to always have at least a few pairs of old jeans that I can't wear, but can't seem to part with either. Some of them have been flat worn out, some don't fit anymore, and some are just sentimental, but out of style. Throw in a husband and a daughter and the jeans pile grows ever larger. There are so many ways to recycle jeans, from the obvious, to the truly different. The first method of recycling that will often come to mind is donation. There are many ways of donating old jeans, Goodwill and Salvation Army stores are a great place to start, but for my nicer jeans that maybe don't fit anymore, I donate them to our local women's and family's shelter in my area. My favorite way of recycling my old favorite jeans, those jeans that I can't bear to part with, but can't wear anymore, is to transform them into something new! I have links to some great ways to turn your old favorites into something fun and useful too, see Jeans Projects for some fun and easy ways to recycle your old jeans into something new. Many times my jeans end up on the "jeans pile", just for a lack of a little tailoring. 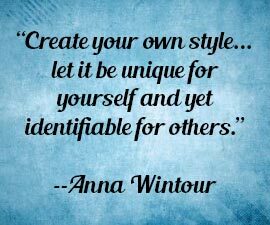 I'm not a great sewer, but I would rather do a little altering, rather than waste a great pair of jeans. 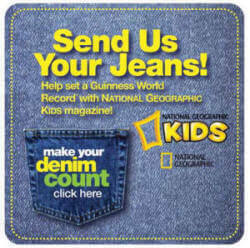 If you want to try something truly unique, NATIONAL GEOGRAPHIC KIDS magazine is collecting denim to set a Guinness World Record™ for the largest collection of clothes to recycle. All of the denim will be incorporated into the COTTON. FROM BLUE TO GREEN.® denim drive. The denim will be recycled into UltraTouch™ Natural Cotton Fiber Insulation and donated to help rebuild communities in need. 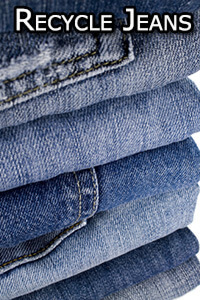 Click here to find out where to send your jeans.